Don't dress halfway. Dress all the way by wearing fancy Italian style dress shoes by Giorgio Brutini. Giorgio Brutini makes exotic style dress shoes out of leather that has the texture that you will swear is real lizard and crocodile. 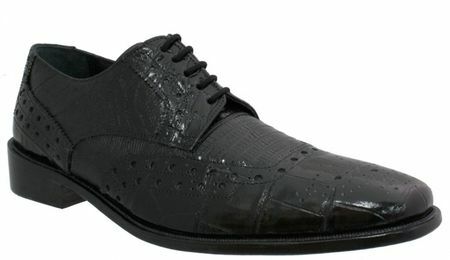 These black wingtip shoes are made of all leather uppers and a full leather sole.